Felon on supervised release, Bernard Kerik, has been telling everyone in media and the man in the moon he is "consulting"to earn a living since release from federal prison. That may sound familiar to some. Felon Kerik was formerly the CEO of "The Kerik Group" after Rudy Giuliani fired him and before Kerik went to prison. 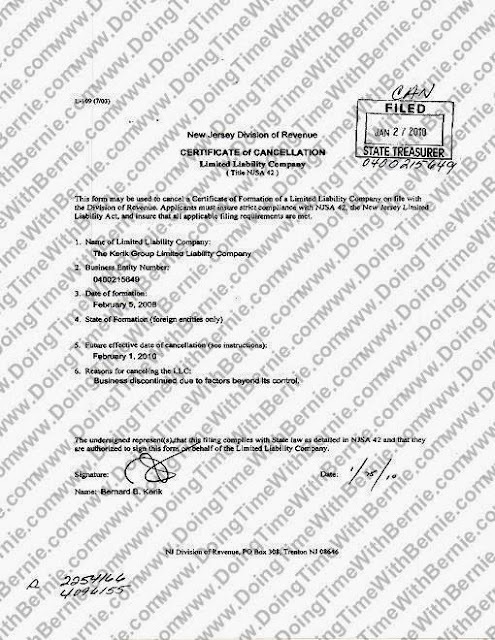 So what does Bernie call his new business as filed in the State of New Jersey on 10/10/13? ...Wait for it..wait for it..."The Kerik Group". 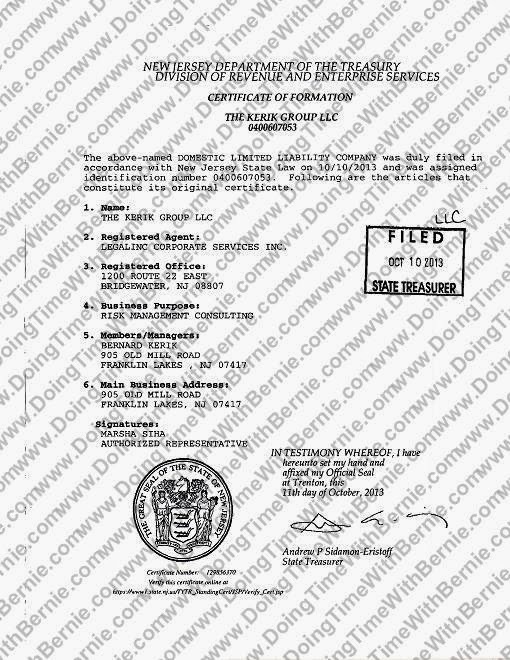 The USA, while investigating Bernard Kerik's eight felony convictions, suspected Bernie funneled money through his company. Those charges never manifested in Bernie's conviction, however the is well documented in USA V. Bernard Kerik (New York Southern District Court, Case No. 7:07-cr-01027-SCR) and, as such, the stigma exists. The purpose of "The Kerik Group" on the State Of New Jersey business certificate is "Risk management Consulting". 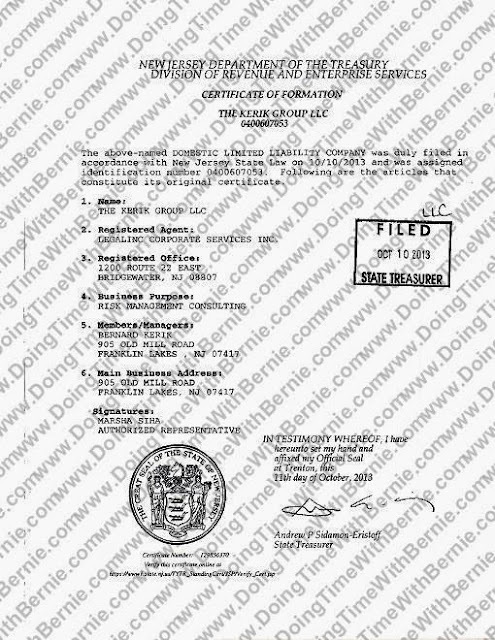 We are not sure how he got away with filing for a business he can't possibly own, run or transact business but that's Bernie and that's Jersey, folks!" Where is Governor Chris Christie? "From Jailer to Jailed" alleged co-author, Dara DAddio, told us, "This brought me back to a conversation Bernie and I had about what the name of his company should he, one day, have an opportunity to own a company again. The former name of the previous company, shut down while Bernie was imprisoned, was "The Kerik Group". As a convicted felon, Bernard Kerik may not sign certain contracts, work for the government, be granted certain licenses, apply for certain business start up loans, etc. Bernie consulted me for my suggestions on a new name for his company. I explained to him using "The Kerik Group" would remind us all of darker days as the former company was subject of Bernie's federal investigation." Felon Bernard Kerik, as a felon on probation (supervised release), is also not allowed to own a gun, license a weapon or even hold a deadly weapon. These restrictions would seemingly prevent him from working as the CEO of a "risk management company". 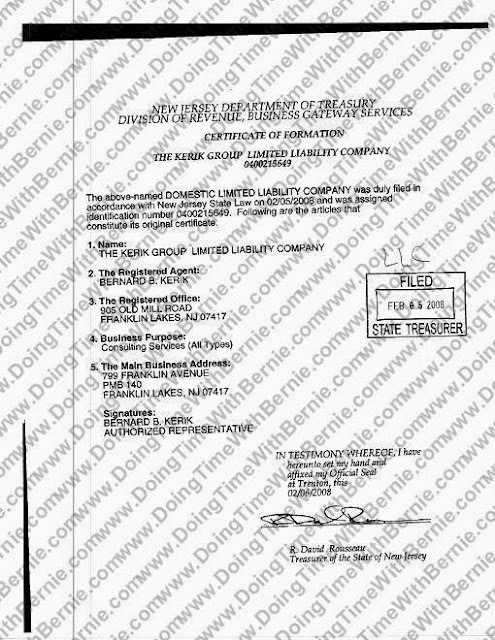 However, the State of New Jersey, Department of the Treasury Filing Certificate shows his "business purpose" as "risk management company". 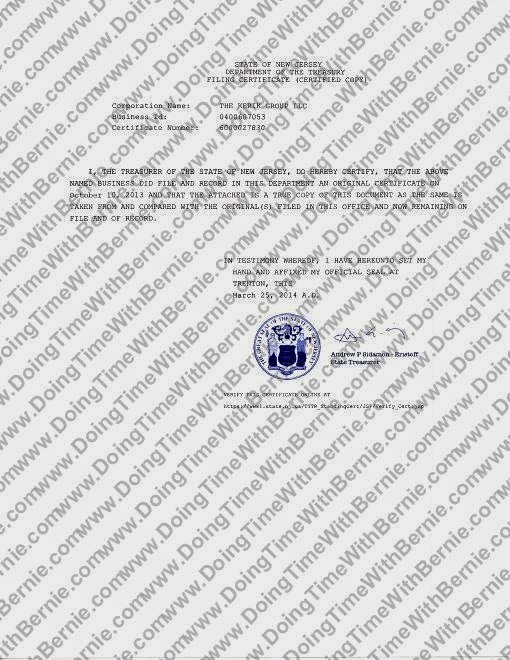 It appears Bernie utilizes his new "The Kerik Group", employee of one, to save face, communicate with all those "associates" and funnel his speaking, publishing and writing fees that are apparently not recognized by Bernie as "work" or "income". Since Bernie is still on probation paying to reduce his HUGE criminal fine, income is an important factor. The nominal amount Bernie pays to the government every month is based upon his ability to pay. It would behoove the government to take a second look at "The Kerik Group" financial statements. By the way, on the bottom of Kerik's TheKerikGroup.com website featurning an unauthorized picture of former President Bush 42 is an "All Rights Reserved" Copyright Protection for TheKerikGroup.com. There is NOT SUCH copyright filed with the US Copyright database. More pretend from felon Bernard Kerik? We should expect this new "The Kerik Group" is a legitimate venture. However, with the old name and the same "old Bernie Kerik" returning from prison in self-proclaimed financial distress, it could return to be the same old......We wonder the amount of IRS federal tax felon Bernard Kerik paid in "doing business" the last three years?